In light of events in Europe, I have been rereading Reinhart and Rogoff's amazing 2008 paper This Time is Different, which I skimmed when it first came out. They consider a sample of about 60 countries which represent 90% of global GDP, and analyze their financial crises back to 1800 (and in some cases earlier). throughout every region in the world, even including Asia and Europe. That said, it seems, at a minimum, plausible, that we about to live through another wave of sovereign defaults like the ones above. Overall, the world has taken on too much debt. In effect, in the last couple of decades, we have been irrationally optimistic about future growth prospects, and, one way or another, some of this debt is going to have to be written off, or at least rescheduled at below market rates. Obviously, none of these past episodes was fatal to industrial civilization taken as a whole. Equally clearly, all of them were very unpleasant and risky to live through as individuals and as families. I grew up on my grandparent's stories of the depression and WWII, and one branch of my family lost most of its money in that wave back in the 1870s. 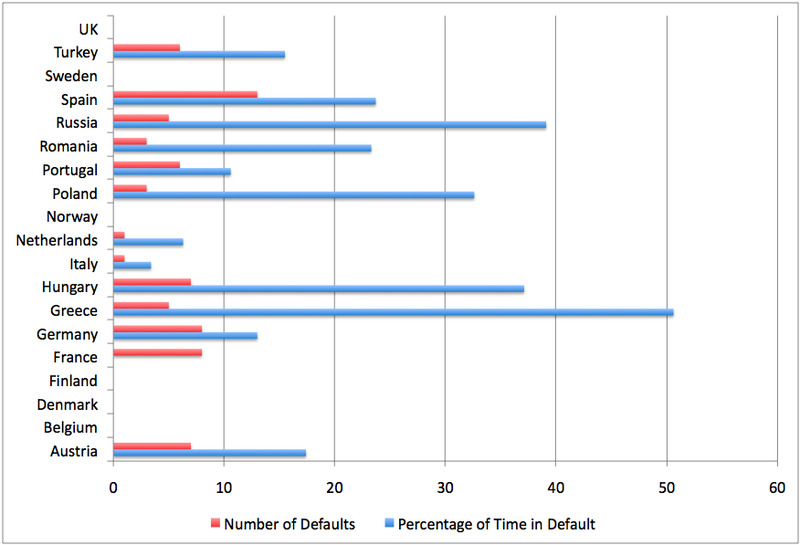 This next graph is based on Reinhart and Rogoff's table 7, and shows both the number of individual default events from 1800 or independence, as well as the fraction of time in default or restructuring, for the European countries in their sample. I think it is important to point out that some of this historical analysis is unconnected to some current conditions. Specifically, the fiat-currency issuing government with freely floating currencies which issue debt denominated only in its own currency is a modern invention. Most of the historical episodes you cite concern external debt, such as Portugal owing gold to Spain, or to private lenders elsewhere, etc. These are real debts, callable by the external holder and subject to default and default risk. They also involve fixed currencies, usually gold-based. The Euro countries have unfortunately saddled themselves with just this kind of risk by not unifying their fiscal policies, such that Brussels will apparently let Greece go down the drain in the euro currency. This is like California going bankrupt- what are the chances of that? Real, if small. If Greece were still in the Drachma, it could issue internal debt essentially without limit (as Japan is doing) limited only by inflation concerns, which are low now due to the economic collapse. It would have zero default risk, but would have inflation risk, which it would have to manage internally. Its trade relations with Europe would be managed in part by its currency exchange rate, which can not happen while it is in the euro, cohabiting with a persistent mercantalist export power-Germany. 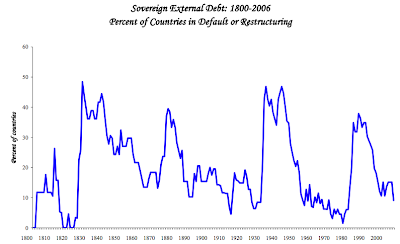 Likewise, the UK, US and similar sovereign nations are under no default risk at all- zero. 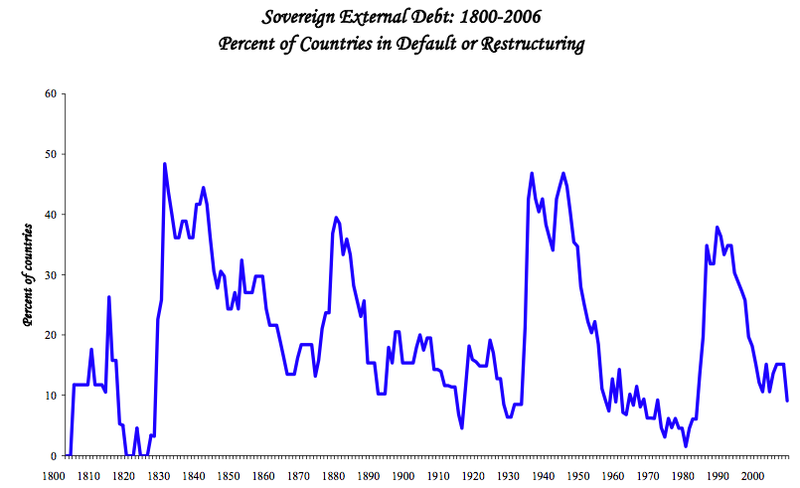 For our entire sample of sixty-six countries, domestically issued debt averages more than 50 percent of total debt for most of the period. (This figure is an unweighted average of the individual country ratios.) Even for Latin America, the domestic debt share is typically over 30 percent and has been at times over 50 percent. Furthermore, contrary to the received wisdom, this data reveal that a very important share of domestic debt—even in emerging markets— was long-term maturity 10 (Reinhart and Rogoff 2008a). In that paper, we also present a variety of evidence to support the view that, at the very least, domestic debt does not appear to be junior to external debt, even factoring in a government’s ability to default via inflation. inflicted on holders of long-term government bonds. 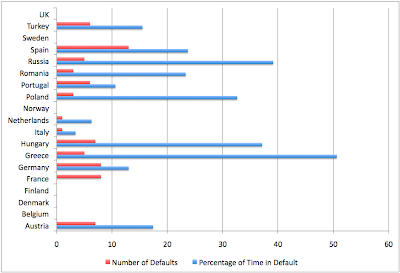 Figure 5 on inflation and external default (1900–2006) illustrates the striking correlation between the share of countries in default on debt at one point and the number of countries experiencing high inflation (which we define to be inflation over 20 percent per annum). Since World War II, inflation and default have gone hand-in-hand. At the end of 2000, just before Greece joined the euro zone, 79% of its outstanding debt was already denominated in euros, and a mere 8% in drachmas. I don't want to make a big deal of this, but can make two points. 1. If countries get into external debt despite having the capacity to issue internal debt, they are obviously playing with fire, rather than creating savings vehicles for their citizens. I was speaking about the capabilities of fiat governments, not their errors and mistakes. The UK and US are not so exposed, at any rate. 2. As per Rogoff, domestic debt should indeed be senior, not junior, since it need not be defaulted on no matter what the financial situation. Only political catastrophe can justify such a move. Russia defaulted on its internal debt along with external in the late 90's, but didn't have to- that was just cruel and unwise. The inflation point is quite correct. Fiat-issuing nations (and others too) have the temptation to debase their currencies. Again, this is a political issue, not a monetary or financial one. You will find, for instance, that the Latin American countries are doing much better now with stable and democratic systems- such as Argentina after its external default. Likewise Turkey after its Lira revaluation. The important point is not to transfer hysteria over Greece and the other PIGS to the completely different situations of the US, UK, and Japan, et al, whose domestic debts are entirely sustainable, even virtuous, at this time. Thanks for the link to that great paper. One thing that I find striking is the geographic clustering of non-defaulters -- Scandinavia, U.S. & Canada, Australia and New Zealand. Not sure what, if anything, that means. Stephen: Weber said it was due to the Protestant work ethic. I'm not sure, Stuart, but are you trying to paint a picture of BAU for ever, based on the fact that there have always been economic cycles? That's the impression I get. In your opinion will you never think that "this time it is different" simply because it's never been different in the past?